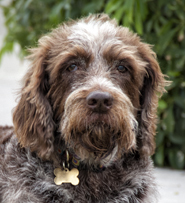 This website is a memorial for our dog Bailee, a fifty five pound Wirehaired Pointing Griffon who after giving seventeen years of love and loyalty to myself and Susan has passed on. She was an active, friendly dog that valued companionship equally to a comfortable bed and a good meal. Bailee loved to be with her owners, new people and other dogs regardless of where or when. Known as a "gun dog" we never hunted with her except in play. If there was ever a true loyal companion it was Bailee. We considered her our daughter and spared no expense on her health and happiness and in return she was there for us when we needed her most. Bailee lived the snow bird lifestyle for half of her life spending summers in Maryland and wintering in Florida; the final years she pretty much stayed on Longboat Key the barrier island we call home. Active is an understatement, she was four paws of energy never refusing a walk, run in the park or her specialty diving in the pool for objects. The dog loved water and the whole concept of "diving deep" and I mean ten plus feet of water depth. Leisure was also an important part of her life as she commandeered the entire sectional sofa for herself and in a way that would afford her total visual access of the front entrance of our home, kitchen area and the rear pool, lanai and bayfront. Always happy to see you especially if you we're away for any length of time, a true devoted friend. A true old dog living among humans, her senior years we're challanged when diagnosed with canine hip dysplasia, a dx we question till this day, arthritis, edema of the eyes and rounded up with a hint of dementia. Heath concerns or not, she was running and swimming almost until the end. Rarely did she whimper or cry except to gain our attention when frustrated with her inability to rise up off the floor or out of bed. Even with the addition of custom door ramps, twenty four hour surveillance via baby monitors, orthopedic bedding a personal "house call" physical therapist administering laser therapy on a weekly basis, two doctors on call and my and Sues hospice care; it's still painful to watch your best friend who was once strong and vital surrender to the sands of time. On February 20th Bailee experienced her first ever seizure at 1:30 a.m., survived and after a little television was able to return to sleep. As the days progressed we noticed she was losing her ability to walk and maneuver as well as she did just a few days earlier and had little to no interest in socializing. Seventy two hours before her passing Bailee was losing interest in food, we tried a diverse menu but only with limited success. Approximately 1:20 p.m. Wednesday afternoon March 7th she experienced her second and final seizure from which she never fully returned. You may wonder why I used a forest theme for a memorial website. In my mind heaven is a place unique to each individual and living thing on this planet. Bailee, being who she was and true blood of a sporting hunting breed loved the outdoors, running, swimming and diving in places where many humans and even animals would fear to go. With this in mind, her heaven could be a cool day in a pleasant forest filled with exotic fragrance's and friendly creatures. A bit about her humans. I'm a web developer designer and owner of a company thats been wrangling pixels since 1998 and was adopted by Bailee when her master, Susan who is now my girlfriend became serious about our relationship. Sue is a devoted dog lover and professional fine art photographer who's love and care was instrumental to Bailee's quality of life.